The story of Wahaka Mezcal is kind of like an Indiana Jones movie where you're following guys as they roam jungles and deserts looking for prized objects and avoiding explosions. And each of the mezcals produced by Wahaka tells a different chapter in that story, but before we get there let's be sure we're all on the same page about the basics of the product. All tequila is mezcal, but not all mezcal is tequila. So what's mezcal? Any distilled agave spirit. Agave is a botanical relative of the lilly that can be roasted, pulverized and then fermented. Most folks are familiar with the outcome of this process as it powers their Margarita or, in some cases, the body shots they vaguely remember doing last year during spring break. But there's more to it than Cuervo and training wheels, amigos. A whiles back, the thirsty folks just over the great wall of Texas realized that one variety of agave, the blue agave, matured quickly (about 6 years versus 20 or more for some of the agaves found in Mexico) and had high sugar content good for fermenting into alcohol. The popular and wonderful world of tequila has turned the distillation and aging of this one agave variety into a delightful art. Thing is, there are a lot of agave varieties that create dramatically different flavors than the ones you'll find in that tequila bottle. And the artisans at Wahaka Mezcal are doing their part to make those flavors available to you, the Utah drinking public. So, here's where the story gets fun. Unlike the commercial tequila plantations raising blue agave in nice little rows for quick maturity and roasting the piña (that's the fleshy fruit that contains all the sugars) in a massive industrial oven, the boys at Wahaka are spending a fair bit of their time roaming around their home state of Oaxaca (pronounced Wa-haka... see what they did?) with donkeys and looking for wild agave. They're distilling wild varieties like the Jabalí (translates to "wild boar") that has foiled many other palenques (mezcal distilleries) because it tends to explode stills when handled wrong (like I said - explosions!). Or the Tobalá variety grown at very high altitude that matures excruciatingly slowly because it's only water source is morning dew. Those two mezcals will be as different as Islay and Highland scotch, with the Tobalá showing off delicacy and floral notes while the Jabalí behaves more like a wild boar smoking a Cohiba. If you taste either one - or both right next to each other - you'll have no problem understanding exactly what we mean when we say the story of Wahaka tells itself as you work your way through a few of their expressions. Where can you do that? Well rumor has it that Lucky 13 and Lake Effect both scooped up a great selection of the special offerings last time Wahaka came through town. White Horse in downtown SLC is another bar that stocks a few options. If you'd like to drink at home, Wahaka's only offering available to us at the ABC stores is on sale this month for $31.99. The Espadin is made using an estate-grown agave of the same name and is made using the same artesian techniques employed on the wild-harvested varieties. 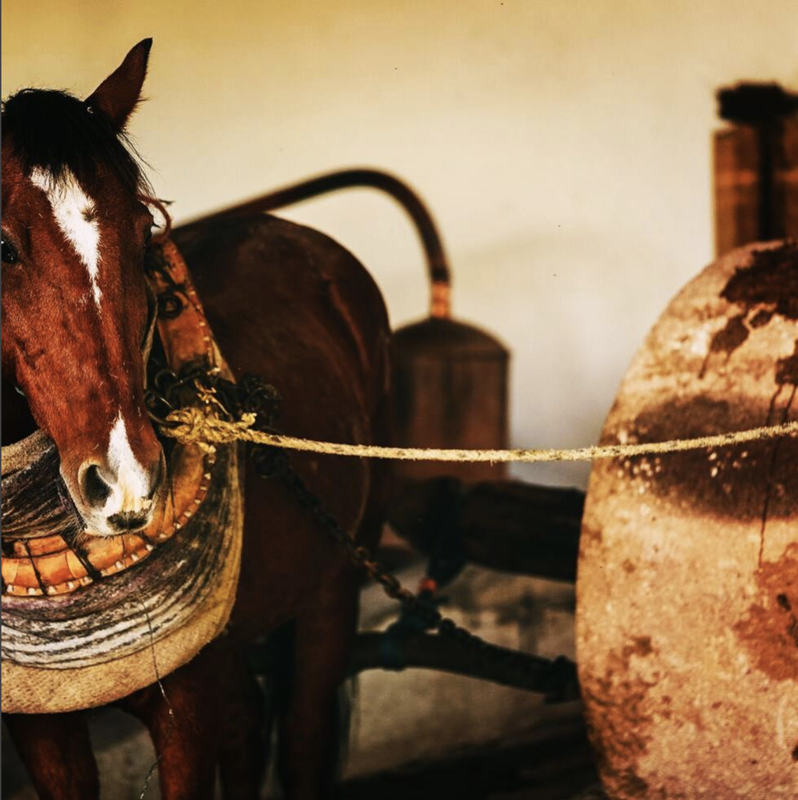 This means that the piña is roasted in an earthen pit for 3-5 days and then milled with a stone called a tahona pulled by a horse named Paquiao. Starting here is a great idea as the Espadin is smooth and easy to love even for a first-timer and affordable enough to mix into a cocktail here and there if you feel like it. Meet Paquiao - the guy in charge of the milling.